Besides checking out the modern VIE Bangkok Hotel near the Pratunam area during our 4D3N Bangkok Weekend getaway, PassportChop.com also had the opportunity to stay at the interesting and beautiful boutique hotel – Shanghai Mansion along Yaowarat road (Bangkok’s Chinatown area). The Shanghai Mansion offers a number of very unique rooms from the spacious Mu Dan – Peony Suites (which is further divided into 12 luxurious “Peony Classic” suites and 4 “Peony Contemporary” chic suites) to the exquisitely designed Ying Hua Cherry Blossom Havens Deluxe Rooms. Be prepared to be surprised by the amount of detail and effort put into decorating the rooms at Shanghai Mansion from the wooden antique (or rather looks like an antique) wardrobe to even a painting of a lady dressed in early China traditional costume. Despite all the traditional Chinese decorations and room items e.g. silk cushions, Chinese antiques, porcelain teapots, our Cherry Blossom Havens Deluxe Room came with a very bold interior design. The vanity area is located just by the bed with a very open concept – no doors and best of all, a bathtub in the middle of the room! There are 2 cubicles – one for shower area (if you prefer showers or slightly more privacy :-)) and the other as toilet (there are even magazines available for browsing inside!). Besides the opportunity to stay in a room with a very unique decor, there is an additional perk for staying in Shanghai Mansion – whatever is in the minibar is free of charge and is replenished daily! It is not exactly a feast – 2 packs of Oreo (3 cookies in each), 2 mini-pack of Lays potato chips, 2 bottles of mineral water, 3 canned drinks (Singha beer, Pepsi and Lemon Tea)- but just right for snacking while you shop or sight see around Chinatown. The unique decor extends out even to the common areas outside the rooms where there are lounge chairs with chess sets and books available for you to play and read. These items e.g. abacus, antique pots and even a guzheng serve as excellent “props” for photography as they are as real as they can get. Every corner of Shanghai Mansion serves as excellent backdrops for photoshoots – its no wonder Shanghai Mansion is one of the most popular destination in Bangkok for wedding and modelling shoots. If you can’t get enough of the minibar in your room, there are also free snacks e.g. potato chips, crackers along the corridor! Breakfast is served daily at the Cotton (which converts into a pub/bar in the evening with live bands playing). You can enjoy a Chinese Dim Sum buffet lunch which also comes with porridge, fried rice and noodles and DIY wanton soup (you dont have to make your own wanton – just take your pick of the number of wantons you want and pour in the ready-made soup). Avoid the peak hours of 9am as Cotton gets real crowded and your favorite dishes especially the wanton soup and dim sum are usually snapped up quite quickly. 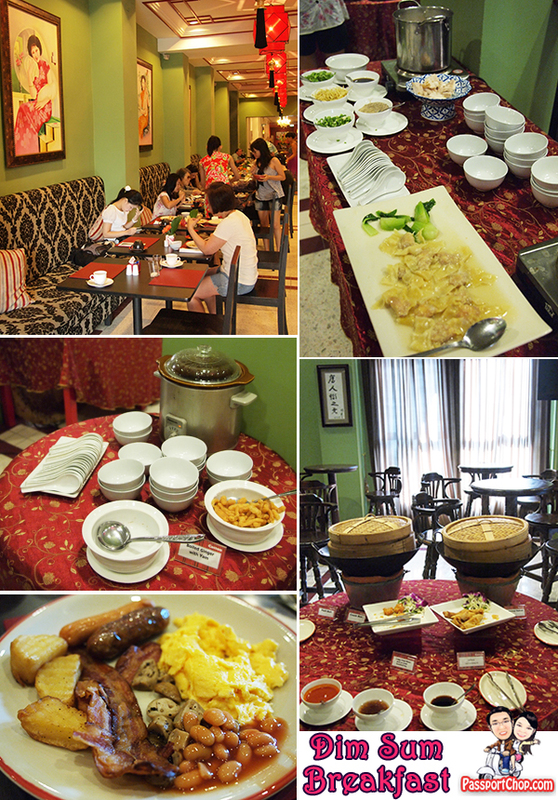 There is also a Western breakfast option – you will have to order from the waitresses (dressed in cheongsam to fit in with the overall Shanghai Mansion theme) their Western breakfast which comes with sausages, scrambled eggs, baked beans and potatoes. Order as soon as you get into the Cotton as it takes the kitchen sometime to prepare this breakfast set – meanwhile feast on the yummy dim sum or take pictures around the restaurant which is just as elaborately decorated with Chinese paintings and lanterns. 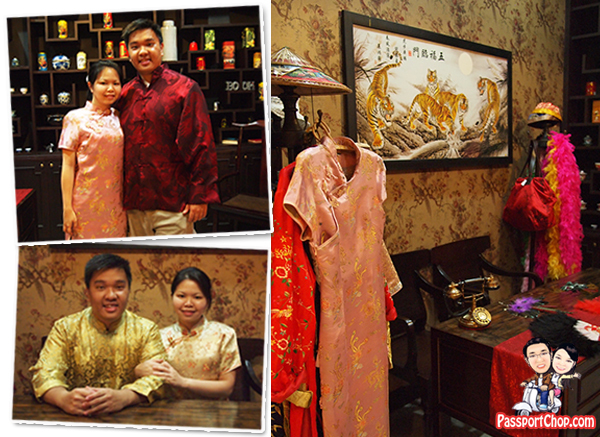 After immersing yourself in the Chinese culture and decorations all around Shanghai Mansion and you feel the strong urge of being part of it all, Shanghai Mansion also provides you with that opportunity! A Gallery had been setup near the Cotton restaurant where you can find all the costumes, props e.g. hats, caps with the Chinese traditional pigtail, fans, umbrellas and all sorts of things you thought you will only see in Chinese period dramas or movies such as Shanghai Noon! Feel free to play dress-up with all these props – no need to ask for permission from the hotel staff – just ensure you put everything back where it was. If you like a certain item in the Gallery, you can also buy it (the price tag is pasted on the item). 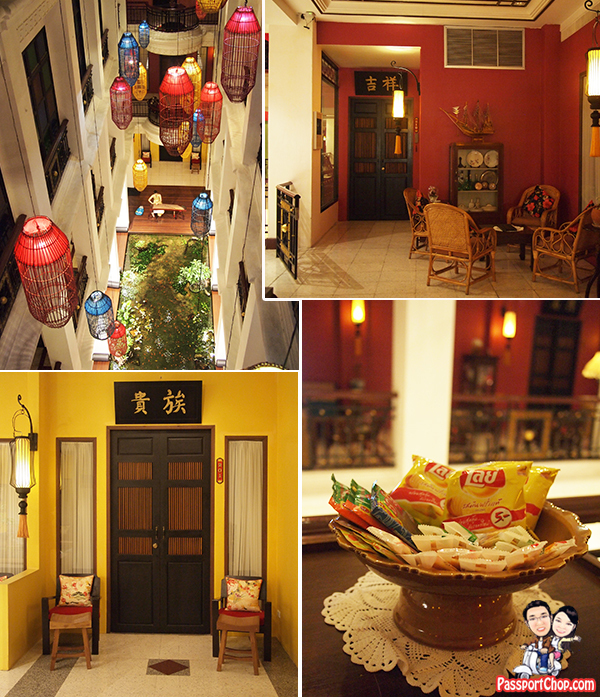 Besides offering an fun and beautiful environment to stay, Shanghai Mansion has definitely done its best to offer its guests an enriching experience and opportunity to learn about the Chinese culture and where better to do it then right here in Bangkok’s Chinatown! Located in the heart of Bangkok along exciting Yaowarat Road, the Shanghai Mansion sits right in the hub of the city’s busy and historic Chinatown. Many attractions and great eating places lie just minutes from Shanghai Mansion e.g. the famous Namsin Bird’s Nest is the hotel’s neighbour (located just downstairs next door) and the T&K Seafood with its rival R&L Seafood are just about 5 minutes walk away! The famous accessories wholesale shopping area – Sampeng Lane is only about 10 minutes walk along Yaowarat Road and along the way, you will pass by a number of grandfather clock shops (perfect if for some reasons, you are looking to buy some grandfather clocks here in Bangkok). Room rates at Shanghai Mansion starts from 2500 Baht per night and there are often special promotions available with discounted room rates or additional perks e.g. complimentary airport transfers so check out Shanghai Mansion’s promotion page for more details. This looks like something worth checking out the next time I am in Bangkok. Its looks like you could really fall in love with the charm of this place! You’d exceptional recommendations here. I did a hunt on the matter and observed that probably the majority will agree with your web page.